"Looking for a tasty way to use all those summer tomatoes? You've come to the right recipe. This makes a great appetizer or a light meal for 2." In a medium bowl combine tomatoes, parsley, chives, garlic, basil, olive oil, salt and pepper. Cover and refrigerate for at least 1 hour, allowing flavors to meld before serving. 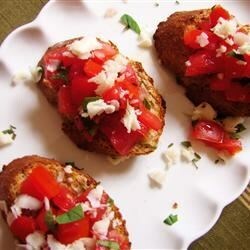 Replace the parmesan cheese by a tablespoon of good balsamic vinegar and this will be a healthier bruschetta. DELICIOUS! Great recipe. My family and I couldn't stop eating this, it was so good. I did add some vinegar to the recipe as some other users suggested. I'm glad I did cause it made it that much more good. I made this yesterday for a party a friends houses and everyone raved about it. My GF said it was the best Bruschetta she had ever tasted.